Winter weather was always going to be unpredictable. 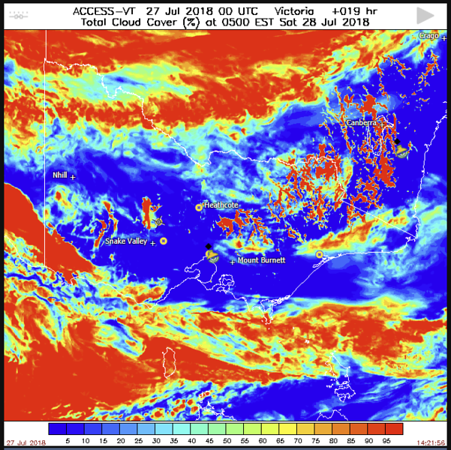 After a series of cloudy and windy cold fronts throughout July, a milder Friday with a low pressure trough to the north-west of Victoria changed things up a bit. 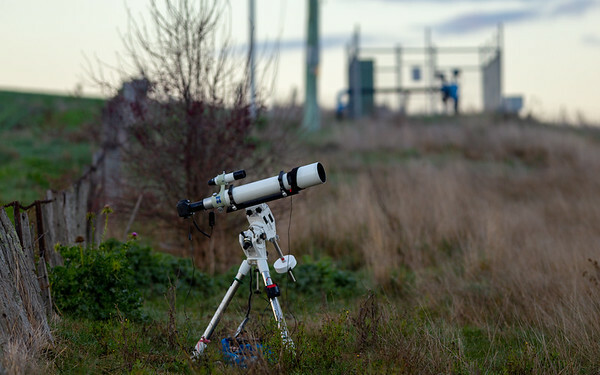 Travelling north as would normally help was ruled out and on eclipse eve conditions and the forecast for central Victoria looked quite promising. The cloud forecast indicated some fog in my area of central Victoria, but I was prepared to stay high and gamble on avoiding those. Otherwise the forecast for central Victoria was promising (better than anywhere else within range) with mid level cloud associated with a trough ruling out any trip north. BoM ACCESS weather model cloud prediction for eclipse time. 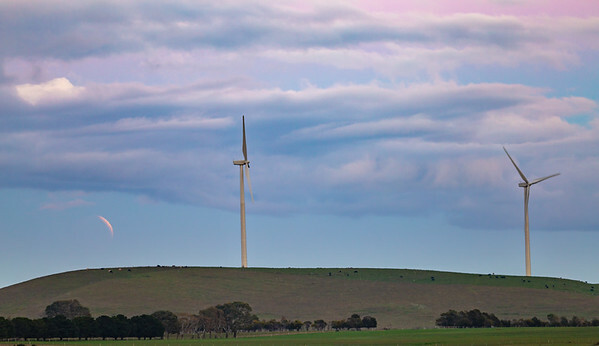 During the day I scouted some locations around the Waubra wind farm in the hope of having some dynamic foreground for a composite image and also for when the eclipsed Moon set during bright twilight. I also planted one timelapse camera on Mount Glasgow very close to home. Canon 6D Mark II @ISO200 with Sigma ART 50mm lens @f4. Exposures of 1/45 sec for partial phases (longer through clouds) up to 10 seconds long for totality and foreground during twilight. 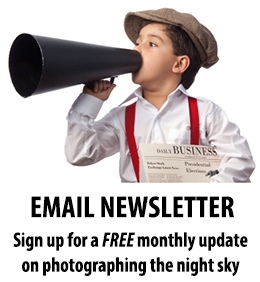 The image above is 'manipulated art' rather than authentic photography in this case due to the weather. I had to stretch several of the Moon frames that were captured through clouds and even duplicated a few of them to fill in gaps in the sequence. All the frames were then stacked as 'Lighten' layers in Photoshop together with a foreground image captured during deep twilight, but with clouds where the Moon had been shortly beforehand. Timelapse with Fred Vanderhaven's automated bulb ramping controller. 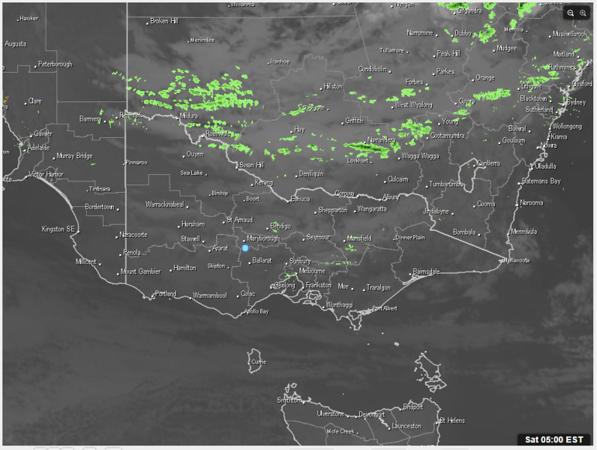 Satellite image at eclipse time showing extensive mid-level cloud over central Victoria. Remarkably for winter the clearest conditions were along the coast. Bright Moon on left is 1/30 sec exposure, red Moon is 8 seconds during totality. The image above is a composite of two images, selected from only a few frames captured through the scope during gaps in the clouds last night. 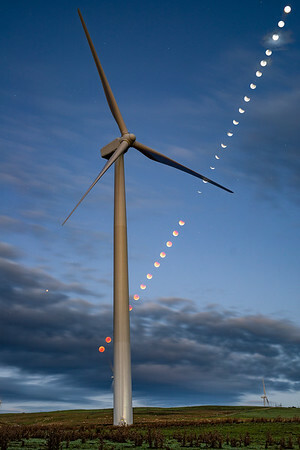 The two 'Moon's are positioned roughly approximately correctly against the background stars to show the movement of the Moon into Earth's shadow. 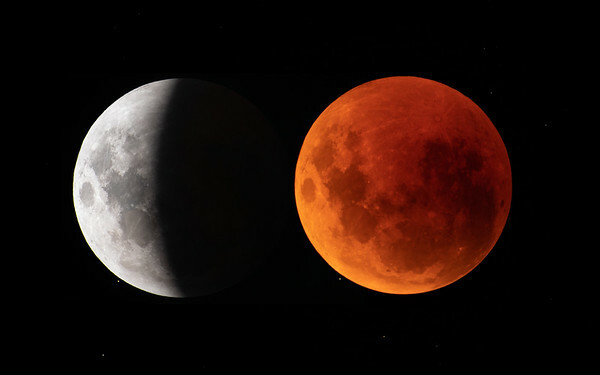 The following two images show the Moon just coming out of eclipse as it sets shortly before sunrise (happening on the opposite side of the sky). 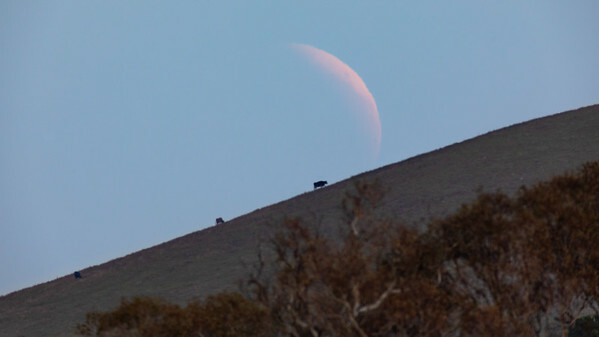 The eclipsed Moon is too dark to see against bright twilight sky but the part that has exited Earth's shadow and receiving direct sunlight again is bright, but in this case reddened by being low in the sky, not by being inside Earth's shadow. 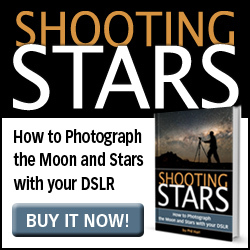 The first image is at 1300mm focal length through the telescope, the second a wider view at 300mm focal length. Takahashi FS-102 with Canon 5D Mark IV and 1.6x extender (1300mm focal length, f13). Canon 6D, Pentax 300mm ED IF lens. For my Central Highlands Water colleagues, that is the Gordon Hill Bore site in the background of the image below. The remote camera I left setup for the wind turbine composite image above was just around the hill from the Waubra water treatment plant and tanks. My telescope for the eclipse.